We're back again with more pictures from Comic-Con. We're still on Preview Night, finishing up the convention and venturing out into San Diego in the evening. Let's check it out! This was one of the coolest displays at the show, as the dragon was partially animatronic. The eyes opened at various points and glowed. Oh, Sideshow...why do you make such great stuff? You can't quite tell the scale here, but this Dr. Doom statue was around four feet tall. An interesting thing about Sideshow is that while they have a large, prominent display at Comic-Con, they don't sell a single thing. It's all just to look at. I suppose it's a good enough marketing scheme that they keep coming back year after year. I know if makes me want to buy their products. Amazing how high-end collectibles have exploded over the last number of years. I was fortunate enough to get a parking pass at the convention center for a few of the days. I took the stairs back to my car afterwards to unload the things that I bought and I saw this vehicle parked close by. They didn't just stick with the decal, though...the side of the car was similarly decorated, including the gas cap. Dedication to Hydra, it seems. There's a San Diego-area cinema makeup school that must see Comic-Con as an opportunity to market themselves...and when you get costumes like this, it's easy to see why. I think the most impressive part of this New 52 Joker was the mouth; it moved naturally as he talked. The Gaslamp District always holds great events as it has a prime location in relation to the convention center. One of the best is the Chuck Jones gallery and its display of high end comic and cartoon art. Here's art based on the "How to Train Your Dragon" movie series. The Interactive Zone blew up this year as compared to 2013. Even though nothing was up and running on Preview Night, I walked over to check out what would be there. Back again was the Adult Swim Funhouse. It was the same thing as the year before, but if you've got something this big (and presumably expensive), you might as well get some more use out of it. Next to the Adult Swim setup was a display of classic cars from the new Sin City movie, along with a backdrop from the city. There wasn't a lot to the display beyond the cars on days when this was in use, but it was still very cool to see. A Sleepy Hollow setup. Interesting note: Sleepy Hollow films in Wilmington, North Carolina, former stomping grounds. New addition to the Adult Swim area: Meatwad's dome. Got a chance to go inside on Saturday night. Pizza Hut was really promoting the new Teenage Mutant Ninja Turtles movie at the show. I got caught up in it for sure. Here's a couch made entirely out of pizza boxes. You could sit on it and put your feel up on the pizza box coffee table. One of the highlights of the Interactive Zone, for me, anyway, was the TMNT pizza launcher. It was functional and you could sit on top and launch fake pizzas out of it. It was still being worked on into the early hours of Thursday morning. I had a chance this night to meet the guy who was in charge of the team that build this monstrosity. We talked for a few minutes about what went into it, and he seemed very excited about, well, my excitement. As luck would have it, four guys in different TMNT shirts waked by as I was looking at the pizza launcher, and I was able to get this picture. Pizza Hut apparently thought it was a great advertisement, and they used the image on their Twitter account. Cowabunga. After wandering away from the Interactive Zone, we went deeper into the city. One of the places we visited was the Barcade, a combination of...a bar and an arcade. Here we see a giant Jenga set, which soon afterwards toppled over with a loud crash. At the end of the night, we came back to the parking lot to find people already camped out for the next day. Many were sleeping and most of those awake looked miserable. But this is what you have to do if you want to be first in line at Comic-Con, I guess. 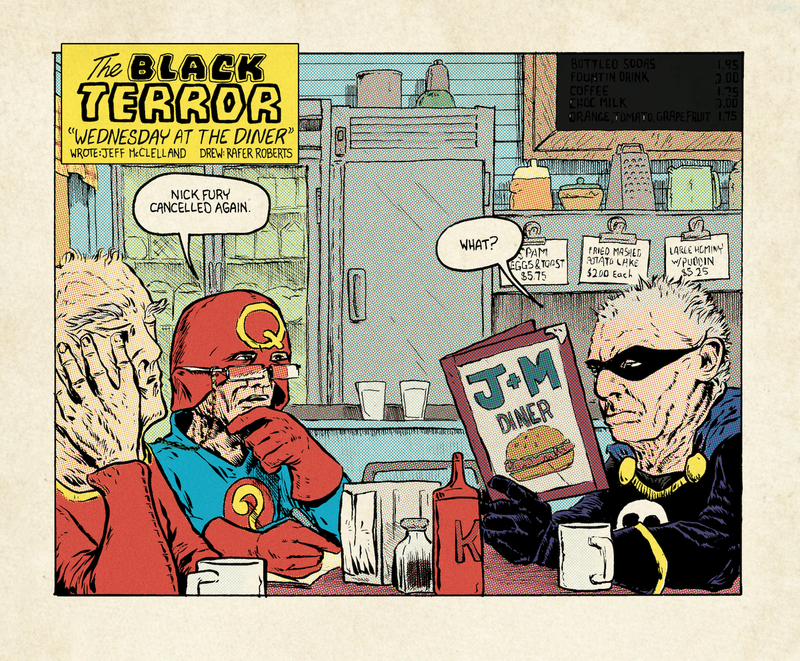 Read "Black Terror: Wednesday at the Diner" by McClelland and Roberts for free! It's kind of weird putting my own name in the title of one of these posts. But I do it for the Google. 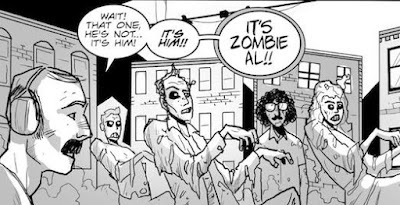 Recently, Rafer Roberts (he of FUBAR, Magic Bullet and Plastic Farm fame) and I put together a short comic featuring several public domain stalwarts from the Golden Age of comics. World War II was almost 75 years ago, and the fighting members of that great generation, those who are still alive, are in their 90s at least. Superhero comics as we know them today owe much of their existences to the WWII era, so I thought it'd be fun to write a story about a few survivors from the first age of superhero comics. Superman obviously wasn't available, but many comics, now nearly forgotten, feature characters who have since passed into the public domain and are free for anyone to use. Thanks in part to the Dynamite series "Project Superpowers", some of those characters have made their way back into the public spotlight, at least a little, notably the Black Terror and a few others. Along with BT, I picked up the Silver Streak, Mr. Q, The Fighting Yank and the Martian Mentalist for this story about some old folks meeting for breakfast at a diner. Rafer, of course, knocked the story out of the park with his attention to detail and his expressive characters. The plan is to print this story in the back of an upcoming issue of Teddy and the Yeti, but for now we've posted it, in its seven-page entirety, online and free for anyone to read. Pictures from the 2014 Comic-Con International, part 2: Preview Night! Welcome again to another installment of...uh..."Jeff posts pictures from Comic-Con". That's not a great title, but it'll have to do for now. And I suppose it does its job. Anyway, let's get started with some pictures from Wednesday, July 23rd: Preview Night! In all honesty, the term "Preview Night" is a bit of a misnomer for the first night of Comic-Con. The first show I attended, back in 2006, had a feel more in line with what you might expect: people calmly walked around the lightly attended event and looked at the booths and what was for sale. Not a lot of transactions happened on this night, but attendees could make a list of places to visit when the convention started up in earnest the next day. Those days are long gone, as Preview Night is one of the more manic scenes at Comic-Con, where people clutch and grab for exclusives in an attempt to beat the rush and find what they're looking for with reckless abandon. A three hour window and ravenous fans sometimes leads to some fairly absurd scenes, and this year had some good examples of this. But I'm getting ahead of myself...there are some pre-Preview Night pictures to be seen. I realize that I'm pretty fortunate when it comes to this big event. I'm able to get my tickets without much hassle, and because a friend had a table in the small press area this year, I was able to get access to the convention floor before the doors opened. I had the same experience in 2012 and it is fun to witness. You get to see booths and displays on their way to completion - sometimes up until the very last second - without crowds of people storming the gates. It's relaxing compared to the stampede that comes once the doors open. Here's the makings of the Walking Dead display, a staple at Comic-Con since the show has been on the air. The mass of people that the operating hours bring helps you appreciate getting to see from one end of the hall to the other. I wonder if this is for sale? Probably not...but if it was, what would the price tag be? If they ever have a similar Thing model on display, I will probably fall down weeping at the sight. As it is, still pretty cool. My professional badge didn't grant me any early access, but as I knew someone with a booth, I got this spiffy sticker that allowed me in while I "helped out". There were a lot of people with similar stickers on Wednesday, many of whom were legitimately helping out, many of whom were trying to get an early jump on exclusives once the doors opened. This, of course, caused a maddening rush to the Hasbro booth once convention started. The Hasbro booth is an unbelievable mess every year. I think the coolest prop at Comic-Con was at the Marvel booth: it's a full-sized replica of the shuttles as seen in the Guardians of the Galaxy movie that was just days away from premiering at the time. This was blocked off, of course, but I'm sure some people (those who worked at the Marvel booth) climbed in at some point. Very meticulous, very articulate. Really cool. As always, people wandered around in the minutes before the convention opened. The convention staff must go crazy every year trying to get people to clear aisles. I, of course, do little to alleviate the situation. What can I say? Here's the Mattel booth, stocked and seemingly ready to go. Perhaps they're having a pep talk before attendees are allowed inside. The second floor storage is clever. Tall ceilings in the convention hall...might as well make use of it. For the second year in a row, I ran into Matt Atchity, EIC of Rotten Tomatoes, while walking the convention floor. It's astounding that he recognizes me, and I appreciate the opportunity to get to talk to him, the big-wig that he is. I met Matt two years ago when he interviewed Larry and me as we were dressed up in our Jet Boy and Jet Girl costumes. Later in the week, I went to the Rotten Tomatoes panel, which is a must-do from now on. Lots of fun...pictures are forthcoming. Here's one of the many displays. These costumes were show-ready, and they had price tags to match. But awesome to look at nonetheless. This was, of course, taken outside of the Walking Dead booth. We all know how easily distracted I can get sometimes. My annoyance at the new Superman costume should be well known. But there's no denying that this guy did a decent job. I saw him at different times during the event and he was always lugging around the American flag. That's dedication. Believe it or not, I did not get kidnapped on my way to San Diego for the annual Comic-Con festivities. I went, I saw, I...well, "conquered" might be too strong a word for it, but I had a great time both in San Diego and then afterwards on a mini vacation to Arizona. Do I have pictures? Oh, my yes, I've got some great images to share with you, faithful readers. Yes, these are pushing a month old right now. But like a fine wine, they get better with age. They'd also be pretty cool right after the fact, but we'll deal with things as they come. Let's look at some pictures from Tuesday, July 22nd - the day before Comic-Con opened! I left Pittsburgh early on Tuesday morning. The two statues (the figure in the middle is a living, breathing Jeff) are nothing new to the airport, but they present an interesting picture: in Pittsburgh, we put Franco Harris and the Immaculate Reception on the same platform as George Washington (who also had a nice string of victories in the area). Also, check out my beard. The flight to San Diego was thankfully uneventful. Almost as soon as I stepped off the plane, I was greeted with palm trees and Comic-Con imagery. Comic-Con branding was in full force all over the city, unlike years past. It was clear that, as big as the show was, it keeps expanding every year. The bridge over the crosswalk even featured some genuine comic book advertising, this from IDW for Walt Simonson's "Ragnarok" series. Even though it was more than 24 hours away, before checking in for lodging, my wife and I went to the convention center to see how things were shaping up. It was already busy (though this is relative). Lots of displays were being hastily finished. Game of Thrones advertised on a number of the busses this year. Here's the Homer Dome being built. I believe this one finished late, actually. This picture was taken around 1 pm on Tuesday, and it's easy to see that there was still a lot of work to be done. It was interesting to see a Godzilla display for the second year in a row. The movie had already been released, so what exactly were they advertising? The DVD release? In any case, this year's convention had a number of interactive exhibits set up on the lawn by the water, a first for Comic-Con (at least in this magnitude). Look for this to increase in years to come. The Simpsons zone, the Godzilla display and the Gotham zip-line were all very well attended throughout the show. A new library popped up in town between last year's show and the 2014 version. It's architecturally distinct and fairly close to the convention center, so I walked over to check it out. Fans of Sherlock Holmes held a Comic-Con party on the top floor one evening. I missed out on tickets, which was unfortunate as I really would have liked to go. The library itself is top notch and features an art gallery on top along with an observation deck (which was where the party was held). The galleries weren't all the way complete when we were there, but I did see some fantastic items, such as this horse sculpture from China's Tang Dynasty, which I assume was named after the powdered drink mix. Here's a view from the top, looking south-ish down the coast. San Diego's a beautiful place, but there's some work to do on this side of the convention center. Tear up those parking lots and put in some parks, SD! I stopped in at the Chuck Jones Gallery on the way back to the car, which is where I saw my first costume of the convention. It's a Chewbacca dog! It counts. Construction on the Assassin's Creed obstacle course was in full swing on Tuesday. This was a popular outside attraction during the show and it had a prime location at the front of the convention center (across the tracks). There was a lot of Guardians of the Galaxy branding around town, as the movie release was just a few days away at the time of the show. Marvel had a stranglehold on the lamppost banners, as I saw them. Next time we'll move on to preview night. Fun times! Comic-Con is always a blast.